During World War II, the San Francisco Bay Area became America’s “Arsenal of Democracy,” causing so many dramatic changes in the Bay Area that the war years came to be known as the “Second Gold Rush.” During that time, the area served as the arsenal’s shipyard, coastal fortress, and a pipeline to the Pacific. World War II dominated the social, economic and political landscapes of the mid-20th century, setting in motion momentous events that still shape the world we live in today. The communities that ring the San Francisco Bay were irrevocably altered by that wartime era and still bear its visible marks in the remains of military bases and coastal defense fortifications, ships and shipbuilding facilities, worker housing and other buildings. Beginning during the California Gold Rush in the 1850s, the U.S. Army had been continually constructing, expanding and modernizing harbor defenses surrounding the Golden Gate and intended to keep an enemy from capturing the port with its strategic military and industrial sites. In the early years, French and British fleets were most feared by American planners, and large masonry forts armed with scores of smoothbore cannon were constructed at Fort Point in the Presidio de San Francisco and on Alcatraz Island in the middle of the bay. During the Civil War and the years immediately following, additional masonry and earthwork fortifications were constructed along both shores of the Golden Gate straits. Well-preserved examples of these semipermanent fortifications can still be seen at Battery East in the Presidio and at Battery Cavallo at Fort Baker. 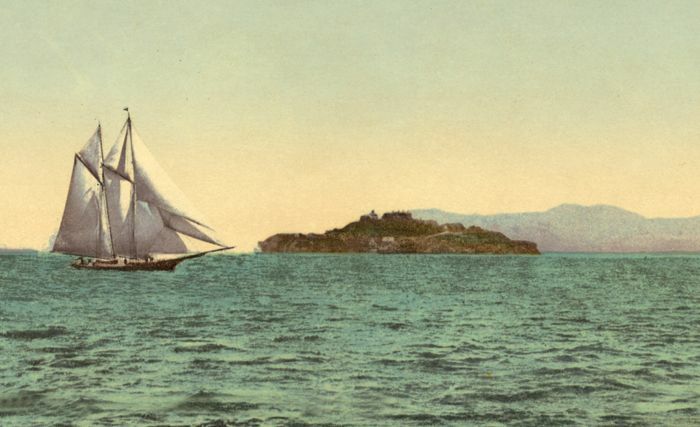 In the 1890s the army began a major modernization of the Nation’s coastal fortifications and, because of its strategic importance, San Francisco Bay was given number two priority behind New York Harbor. This rearmament project resulted in the wholesale scrapping of smoothbore artillery and the introduction of modern breech-loading artillery protected in concrete gun emplacements. Construction of these fixed defenses had a dual role: first, the improved fortifications made the Nation’s ports much more secure and ready to deal with the threat from modern armored warships; secondly, the strong shore defenses freed up the U.S. naval forces from their reluctant role as “floating coastal forts.” This strategic change allowed our navy to sail the globe freely and extend our military presence — and U.S. influence — to foreign countries. 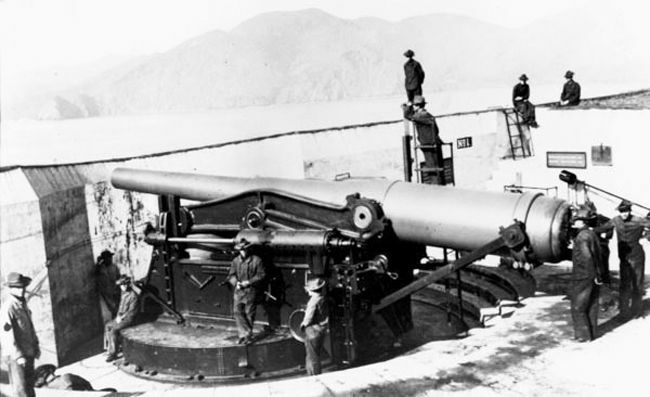 By 1910, nearly 120 coast artillery guns were mounted in the Harbor Defenses of San Francisco. Ranging in size from three-inch rapid-fire weapons to 12-inch long-range guns, these fortifications were designed to meet the threat of any size vessel from a small patrol boat to a heavily armored battleship. These new weapons and fortifications would form the backbone of San Francisco’s coastal defenses until after the end of World War II. 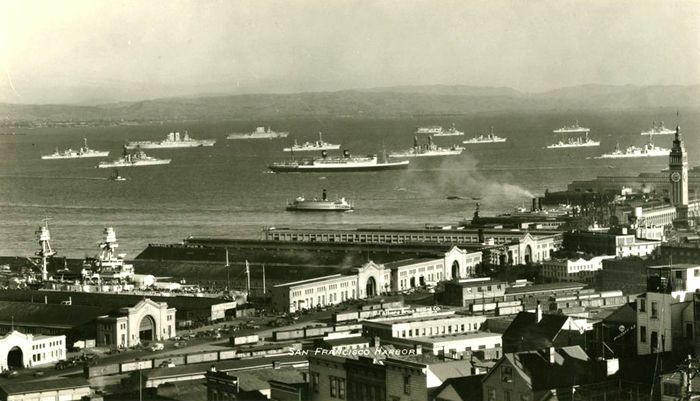 U.S. Pacific Fleet anchored off San Francisco, California, 1930s. As Europe headed deeper towards war in the 1930s, isolationist America reluctantly began to upgrade its coastal fortifications once again. In San Francisco, this program led to the construction of two batteries mounting the largest guns then in American arsenals: 16-inch caliber rifled guns mounted on high elevation carriages, capable of firing 2,100-pound projectiles nearly 26 miles. To protect the weapons against the growing threat of aerial bombardment, each battery of two guns was constructed as a subterranean fortification with the guns aiming out from the sides of heavily camouflaged, manmade hills. Up to 20 feet of overhead concrete and earth cover provided protection for the guns themselves along with a labyrinth of connecting corridors, ammunition magazines, power plants, crew spaces, and assorted storage rooms. To protect the new batteries, antiaircraft guns were concentrated nearby to ward off attacking enemy aircraft. 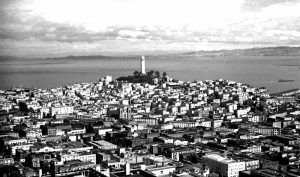 Preparations for mobilization to create “Fortress San Francisco” were massive. 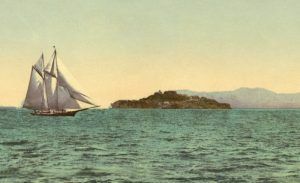 Forts Baker, Barry, and Cronkhite ringed the tip of Marin County, while Fort Point mounted guard on the Golden Gate Straits. 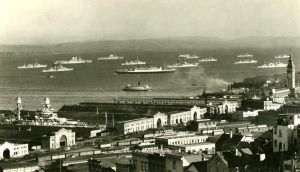 Inside the bay were several bases including Fort Mason, the principal Pacific Port of Embarkation, the Presidio, Fort Miley, Hamilton Field, and Moffett Field. Completed in 1940, Battery Davis at Fort Funston and Battery Townsley at Fort Cronkhite were the prototypes for all subsequent fortification designs adopted by the U.S. Army. 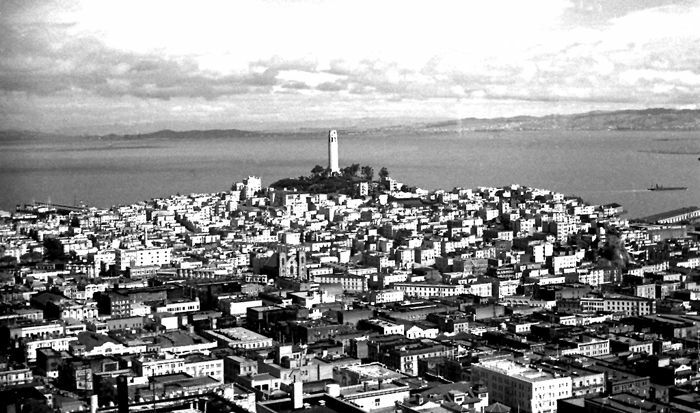 On the eve of World War II, these two batteries formed the state-of-the-art defenses not only of San Francisco but also of the entire United States. 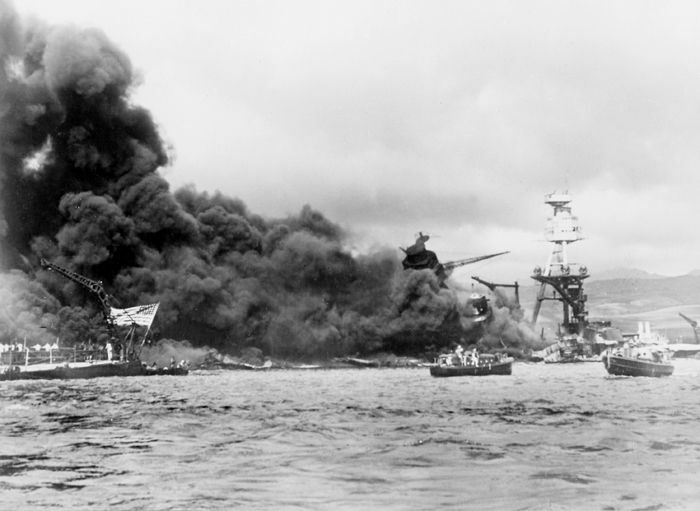 The United States entered World War II after the bombing of Pearl Harbor, Hawaii on December 7, 1941. On December 7, 1941, the Harbor Defenses of San Francisco Bay comprised a mixture of modern batteries as well as aging, but still potent, coast artillery emplacements constructed at the turn-of-the-century; mobile tractor drawn field artillery and antiaircraft guns; and the underwater minefields that still protected the shipping channels. Manning these defenses were an assemblage of “old army” regulars from the Sixth Coast Artillery Regiment, newly-formed units such as the 18th, 54th, and 56th Coast Artillery Regiments, and National Guard Regiments from as far away as Minnesota and Texas. 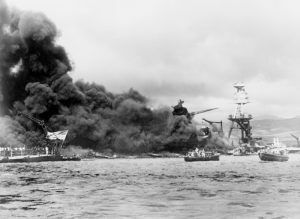 When news reached San Francisco of the Japanese attack on Pearl Harbor, all off-duty personnel were recalled to their units and the harbor defenses put on full alert. Soldiers moved out of their barracks and into the batteries and began filling sandbags, stringing barbed wire and constructing beach defenses at a fevered pace. Up and down the coast, observers in tiny concrete observation posts scanned the horizon for the approach of a Japanese fleet that would never come. 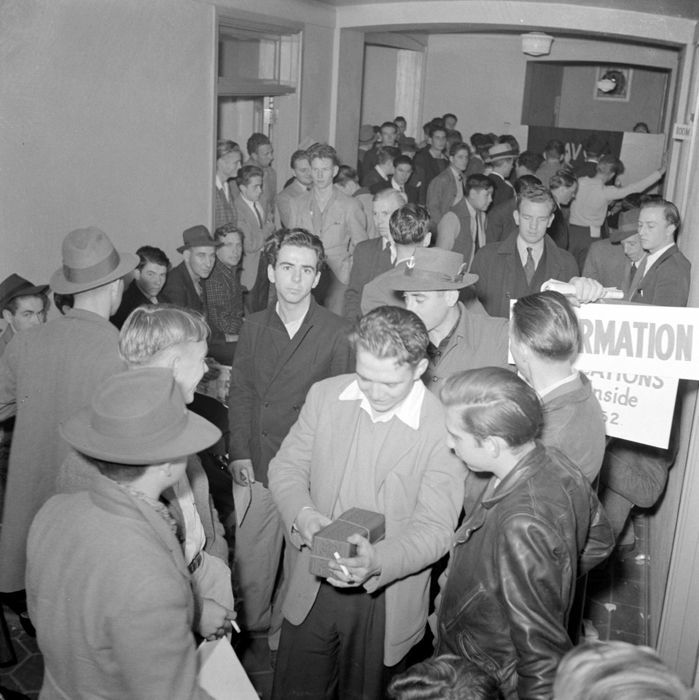 San Francisco men waiting to enlist in the Armed Services, John Collier, 1941. The San Francisco Bay Area’s major contribution to victory during World War II was shipbuilding. During the war, men and women working in Bay Area shipyards, like Kaiser’s Richmond Shipyard Number Three, built 1,400 vessels — a ship a day, on average. Mare Island Naval Shipyard provided well-established repair and shipbuilding facilities. The converted Richmond Ford Motor Company Assembly Plant prepared tanks for shipment overseas to the Pacific War, and the Benicia Arsenal manufactured the munitions for these and other weapons. During World War II, tens of thousands of Bay Area women challenged common perceptions about their capabilities, and for the first time were faced with the problems of being working parents — – finding daycare and housing. These historic places remain today as an indelible imprint of this time and remind us of the dramatic changes brought on by the Bay Area’s participation in World War II. Evacuation of the Japanese from California during World War II. Three months after the bombing of Pearl Harbor in December 1941, President Franklin Roosevelt issued Executive Order 9066, ordering the relocation of Japanese Americans living in coastal areas, who were at the time considered a security risk. In the weeks that followed, local newspapers carried almost daily reports of proclamations, plans, and restrictions to their civil liberties. Japanese internees were first transported to one of 13 “Assembly” centers throughout the state, then on to permanent camps inland. 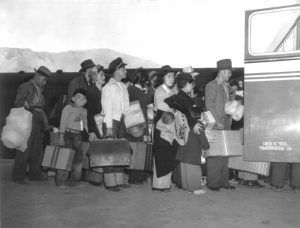 In all, nearly 100,000 Californians of Japanese descent were removed from their homes and livelihoods for incarceration during the war until 1945.